Unfortunately tomorrow’s cold front passage around 10:00am makes it impossible to have our Young Eagles event. Low cloud ceilings, strong wind and rain showers are all in the forecast. The 3/31 Y.E. event is therefore canceled. The next Young Eagles event on our schedule is in August but we will be looking to possibly add another date before that. Please follow us here and periodically check our website at www.eaa501.org. All of our pilots and volunteers are as upset as you are. Everyone puts in a ton of effort and work into making this event happen and we all enjoy it as much as the kids do. Hopefully we will have good weather and clear skies next time. If you are looking for an alternative for tomorrow, please consider visiting the NJ Aviation Hall of Fame & Museum at Teterboro Airport. There are many great things to see there regardless of the weather! 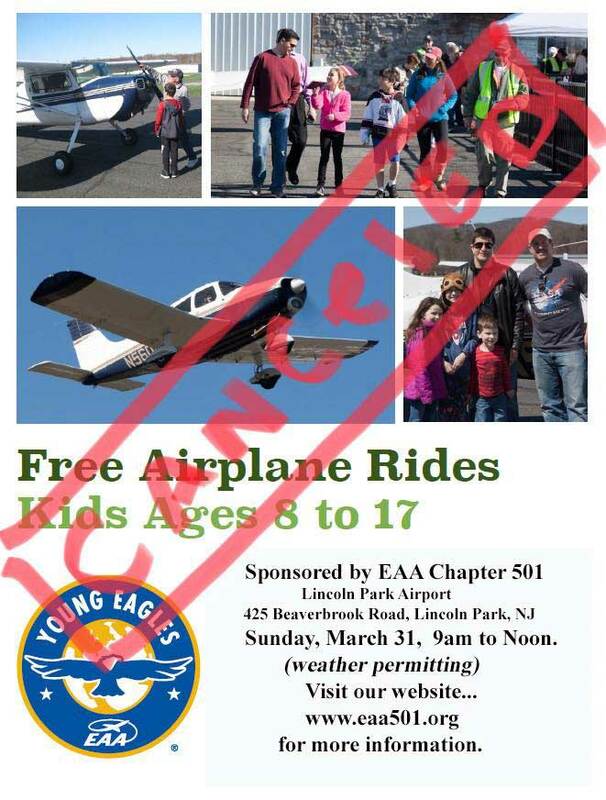 Experimental Aircraft Association (EAA) Chapter 501 will be hosting a free airplane ride for kids as part of the Young Eagles Flight Rally on Sunday, March 31, 2019 at Lincoln Park Airport in New Jersey. Free flights will be available for kids ages 8 to 17. The event hopes to grow youth interest in flying and lead to flight lessons with a certified flight instructor (CFI). Members of the EAA Chapter 501 volunteer their time and airplanes to fly kids around the local area. Other members will help kids getting in and out of the airplanes. This is a great opportunity for kids to make new friends who are also in love with aviation. EAA Chapter 501 is creating a unique opportunity that allows kids to explore aviation! When you arrive at the airport all parents/guardians must fill out and sign the waiver agreement and flight registration record forms. These MUST be signed by a parent or guardian. Blank forms will be available at the registration desk at our base of operations. Be sure to come out to the EAA Chapter 501 Young Eagles Flight Rally this Sunday from 9 a.m. to noon at Lincoln Park Airport. Taking Flight Lesson in a Simulator in Manhattan. Training with a Certified Instructor brings real-world experience to each simulator session and creates a strong knowledge and practical foundation in a student’s training. Lessons in our simulator would be a great compliment to your Young Eagle! Flying lessons for kids in a simulator allows them to get an understanding of the flight controls. The lesson can also be paused so that they may ask any questions or the CFI to explain details about certain maneuvers or functions.